Actually the problem we are discussing here is not like the other blog posts. Its a problem that i faced some days ago and somehow managed to get rid of that. So i decided to share it with the world through my blog so that my readers will not have to worry or spend money if they face the same problem in future. 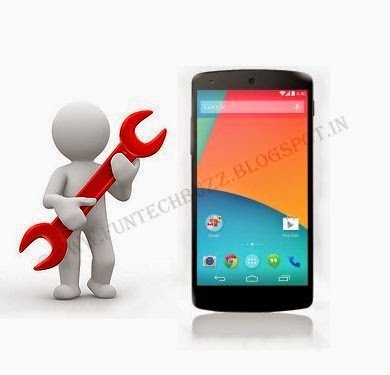 It was my LG Nexus 5 smart phone which stopped working and did not display anything one day. Neither it responded to any tap nor to switches. The phone was not switched off because when i made a phone call to that phone from another mobile i could hear the ring but the nexus was enjoying its silence. As you can't remove its battery so there was no way left for restarting it. Searched some of the reputed tech blogs which i regularly follow but unfortunately none of them featured the solution to such type of real life problems. What funny happened to me was i found many people suggesting in forums to go to the service centre which is the simplest idea that will come to any ones mind. I would like to request those wise persons not to share such outstanding ideas if they really want to help someone out. Thanks to google baba that besides a hand full of seo optimized vague(in terms of contents) it gave me some usefull blogs too where i found a simple solution. And astonishingly it worked too. It was only to keep pressed the "power button" and the "up key of volume rockers" simultaneously for some time and the phone started working again. I thanked that blogger heartly and commented in his blog post too to encourage him. Then i decided to write this post so that my readers will not have to worry or spend money unnecessarily if they face the same problem in future. If you have any suggestions please let us know through the comments.